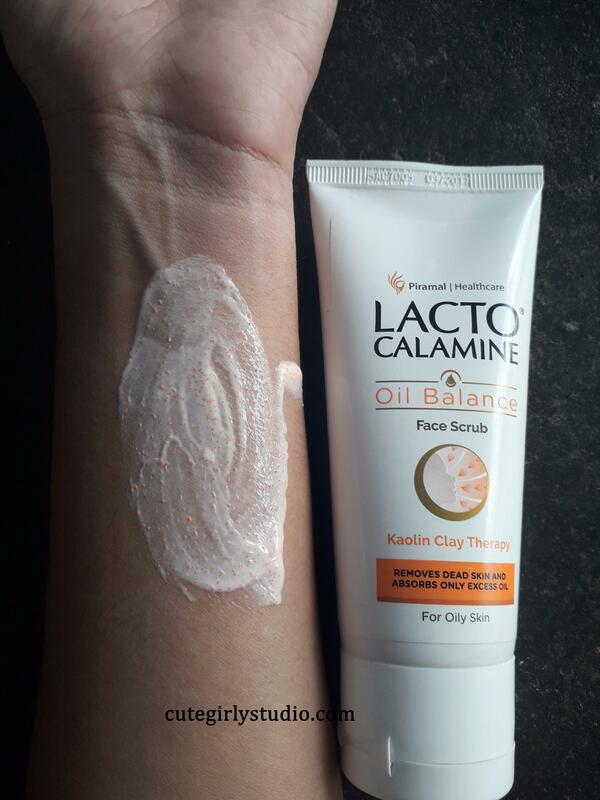 Today I’m going to share my thoughts on Lacto calamine oil control scrub. I have shared my views on Lotus herbals UV screen matte gel in my previous post. You can check that here. If you have read my nykaa haul post, you will know that I bought this in nykaa birthday sale. I’m using this scrub for past 2 to 3 weeks and here I’m with the review. This is going to be a short review, I don’t want this to be a long post. Rs 75 for 50gm of product. I got this in a buy 1 get 1 offer. So it cost me Rs 75 for 100 gm of the product. You can buy this here. Aqua, Glyceryl Monostearate, Cetearyl alcohol &dicetyl phosphate & ceteth10 phosphate, Glycerine, Capric Caprylic triglyceride, Microcrystalline cellulose, Hydroxy propyl methyl cellulose, color beads, cinnamon extract, allantoin, titanium di oxide, aminomethyl propanol, Diazolidinyl Urea and Iodopropynyl butylcarbamate, disodium EDTA, c10-30 Alkyl acrylate crosspolymer, perfumes, light kaolin, colors. These are the toxicity values as per EWG skin deep data base. The Lacto calamine oil balance face scrub comes in a flip-flop tube and it is not at all heavy. The cap doesn’t close tightly in my opinion. So I don’t find this travel friendly. 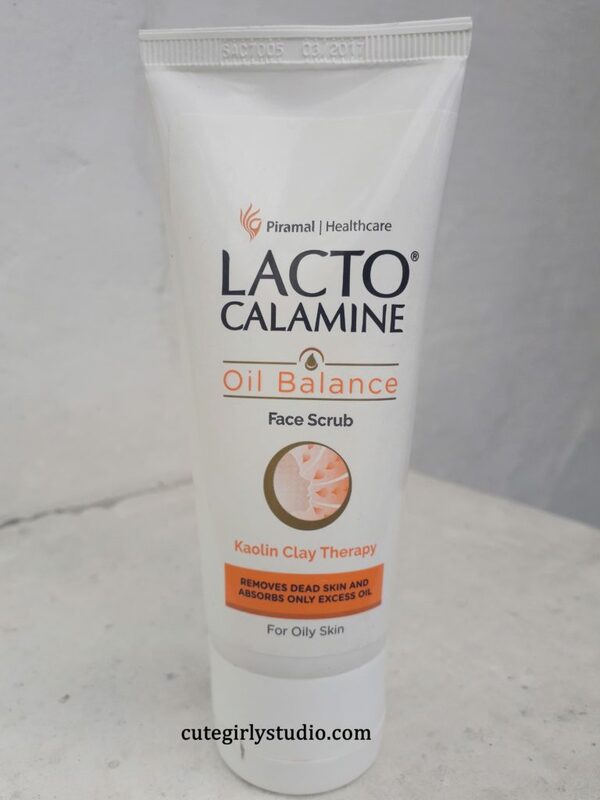 The Lacto calamine oil control face scrub has the fragrance that is similar to the lacto calamine lotion. It has pale peachy color to it. The texture is light and the scrubbing particles are very mild, it doesn’t irritate the skin. Overall I liked its texture. The Lacto calamine oil control face scrub does its job perfectly without being harsh on our skin. I usually exfoliate my face twice a week. Since this face scrub is mild, I exfoliated my face thrice a week with this face scrub. I take the required amount and spread them all over my face and gently massage my face. Then I rinse my face with normal tap water. After pat drying my face I can feel that my skin feels smoother without any signs of irritation. If you are a girl with excessively oily skin, you know that satisfying feeling after a good exfoliation. It removes oils and deep cleanses the pores without stripping the moisture from my skin. Whenever I exfoliate my skin, my skin turns red and feels dry. But with this, I didn’t feel any dryness or redness. Overall I liked this product. They claim that it controls oil and break out but in my opinion, a scrub cannot do so. So I won’t say that it controls oil and breakouts. It is a good facial scrub and does its job well. Yes, if you are looking for a good exfoliator, then this scrub is for you. It didn’t dry out the skin, I think this will suit normal to combination skin beauties also.